There is no doubt that robotics has played a large role in the toy industry from being put into some of the first simple gears and moving parts to advanced robotic toys. The past was riddled with questions on whether or not robots would ultimately become a household instance, but toys with robotic components are available now to answer that question. Robot toys are becoming more advanced with more movable parts, programming and engineering that could easily be used in real world applications and lifelike movement. The Robosapien series by WowWee brand of products exhibits many of these characteristics of modern robot toys. 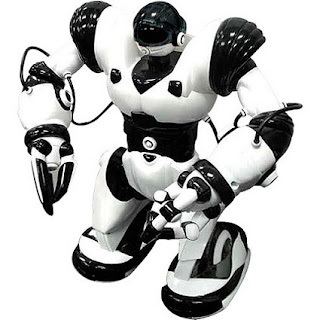 Robosapiens are bimorphic, multifunctional robots with a full range of dynamic movements. Many of the abilities of the Robosapien are interactive with 67 pre-programmed functions and the ability to be programmed by remote in 4 different modes is an amazing feat in a consumer robot toy for children. Present robotic toys are very lifelike and differ very much from the views of the beginning of the Western atomic age. Robotic toys respond, receive and execute commands, attempt to communicate and entertain our children. These toys are marvels of robotic toy history as they are affordable and available to most families. This allows for robotic toys such as the Femisapien, by Wowwee, to exist. The Femisapien can communicate and respond to touch, sound and hand gestures. She is given the feminine gender style and is very intelligent. She speaks her own language called "emotish" consisting of gentle sounds and gestures that can tell you what she is thinking at the moment. Even though it has serious engineering involved, there is some play aspects of the Femisapien such as dancing and comedy acts that she can perform when music is playing or when she becomes bored. The capabilities of modern robotics in toys are exemplified by the amount of entertainment they can provide for children. Obviously, consumer robots are very powerful, but are not designed to carry large work loads and perform very specialized tasks such as industrial robots do. The Tribot by WowWee is a great example of a toy Robot and its modern capabilities. It is very expressive in its facial and body gestures to show programmed emotions. Its three wheeled base allows it to have very accurate turning in any direction. It contains various games and modes to test the abilities of the person controlling its movements. It even contains an alarm function that will cause amusement to all as it is activated and runs around sounding its chimes until it is caught. The future for toy robotics seems to be endless. There are numerous ways that the robot toys industry can take their ideas. The most common theme is to make them more humanoid and interactive. Another route is to make them more animalistic as pets or companions. This allows even those who are allergic to own a pet which can interact and show intelligence like some of the world's most intelligent species. Making robotic toys with the ability to speak or communicate while understanding and performing complex functions are great suggestions for the near future of robotic toys. Robots toys that you build yourself with products such as the Lego Mindstorm Robotics kits will surely be improved upon. The possibilities for future robotics will never end, and until the Holy Grail of robotics is reached where life is emulated into complex robot toys, then we have something to look forward to. Robots will always amuse us, keep us company and provide hours upon hours of entertainment. The future of robotics in toys can only be improved upon, and it is only a matter of time before they become friends and companions that we cannot live without. Blogger and Webmaster since 1999.